Polynyas are areas of persistent open water where we would expect to find sea ice. For the most part, they tend to be roughly oval or circular in shape, but they can be irregularly shaped, too. The water remains open because of processes that prevent sea ice from forming or that quickly move sea ice out of the region. There are two types of polynyas (described below), differentiated by the mechanism of ice removal. One process often dominates in a given polynya, but both can occur. Sensible-heat transfer occurs between two bodies at different temperatures that are in contact with each other. The body with the higher temperature transports sensible heat to the body with the lower temperature. A sensible-heat polynya forms when water that is above freezing upwells, or moves from the lower depths of the ocean to the surface. Heat transfers from the warmer water to the ice, melting it, and preventing new ice from forming. The topography of the ocean bottom or overturning of water causes the warm water to rise to the surface. In this type of polynya, sensible heat from the ocean provides the source of heat needed to melt the ice. Sensible-heat polynyas usually form in mid-ocean areas, far from coasts or other barriers. Diagram of sensible-heat (open-ocean) and latent-heat (coastal) polynya formation. Image modified from Ocean Circulation, 2nd Edition by Open University, Butterworth-Heinemann Publishers, page 219. Latent-heat transfer occurs when matter changes state; latent heat is absorbed when ice melts, and it is released into the surroundings when liquid water freezes. The process is called "latent" because it is not associated with a change in temperature, but rather with a change of state. 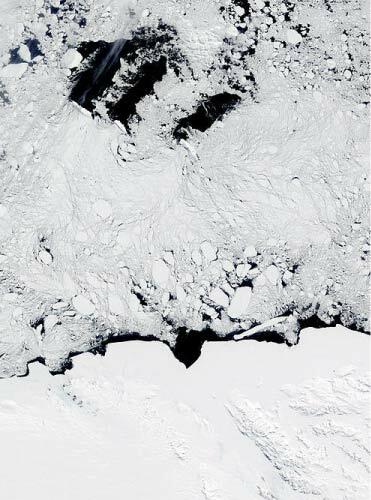 Satellite view of polynyas (dark areas) near Oates Coast, Antarctica (solid white area at bottom of photo). A latent-heat polynya is characterized by ocean water at the freezing point. It forms as a result of winds blowing in a persistent direction that push the ice away from a barrier, such as the coast, fast ice (ice that is anchored to the shore or ocean bottom), a grounded iceberg, or an ice shelf. As new ice grows within polynyas, wind blows it to the leeward side, while the windward side remains ice-free. Latent heat is released as water freezes and also as water evaporates into the air above the open water. Some sensible-heat exchange also occurs within latent-heat polynyas because the water in the polynya is generally warmer than the air above it even though the water is at freezing temperature. When sea ice forms in polynyas or elsewhere, salt is expelled into the water, raising the salinity of the near-surface water. The salt increases the density of the surface water, making the surface water heavier than the water below, causing it to sink. In some cases, the high-density surface water mixes with other masses and sinks all the way to the ocean bottom. Latent-heat polynyas, particularly those in the coastal regions of Antarctica, are a major source of the world's bottom waters, which influence the process of thermohaline circulation (see Global Climate in the Environment section). Polynyas are important for various reasons. Like leads, they are a source of heat and moisture to the atmosphere, so they modify the weather in surrounding areas. As discussed above, they are sources of ocean bottom water. Polynyas are also important resources for wildlife. They provide access between the ocean and atmosphere for a variety of animals, including seals and penguins. Because polynyas persist for longer time periods than leads, and because overturning ocean water brings nutrients to the surface, phytoplankton thrive in polynyas. Phytoplankton are microscopic plant-like organisms that form the basis of the marine food chain. During the summer, Antarctic polynyas are one of the most biologically productive regions in the world's oceans. For more information, see Wildlife in the Environment section.